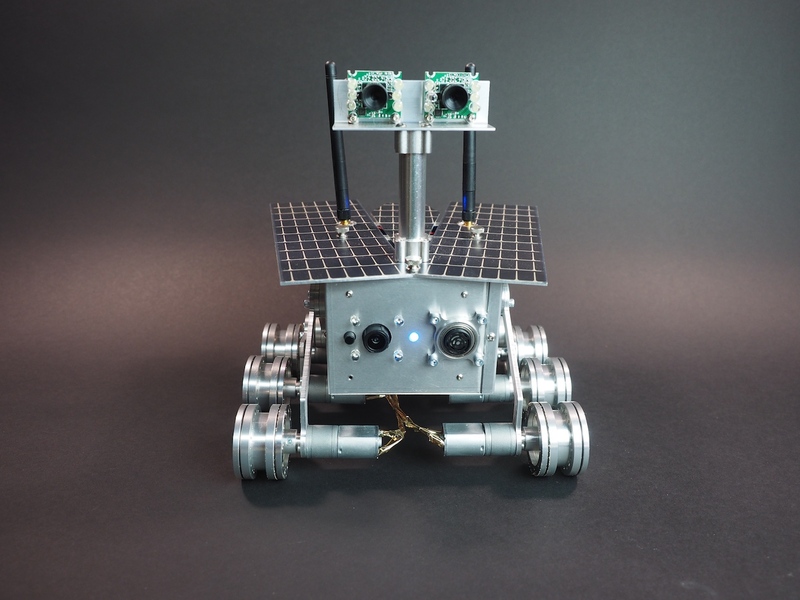 We have just completed and shipped two new Mini Mars Rover exhibits to Petrosains, The Discovery Centre in Kuala Lumpur City Centre. 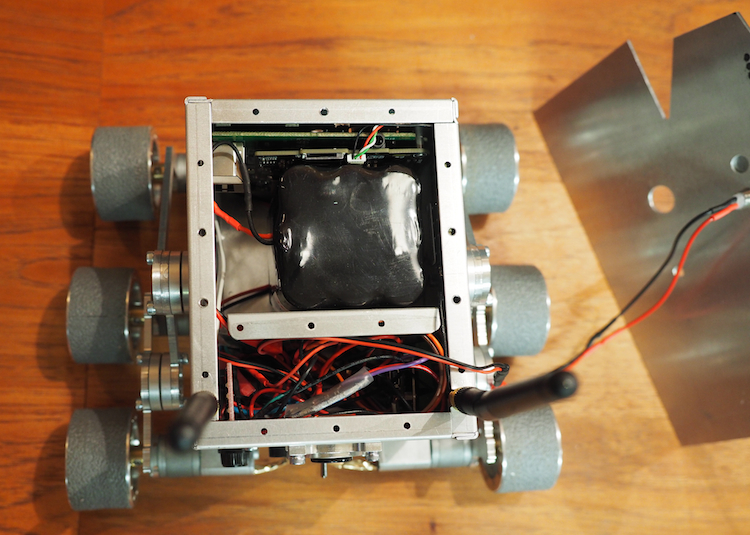 Although very small in size, these little robots pack some excellent features. 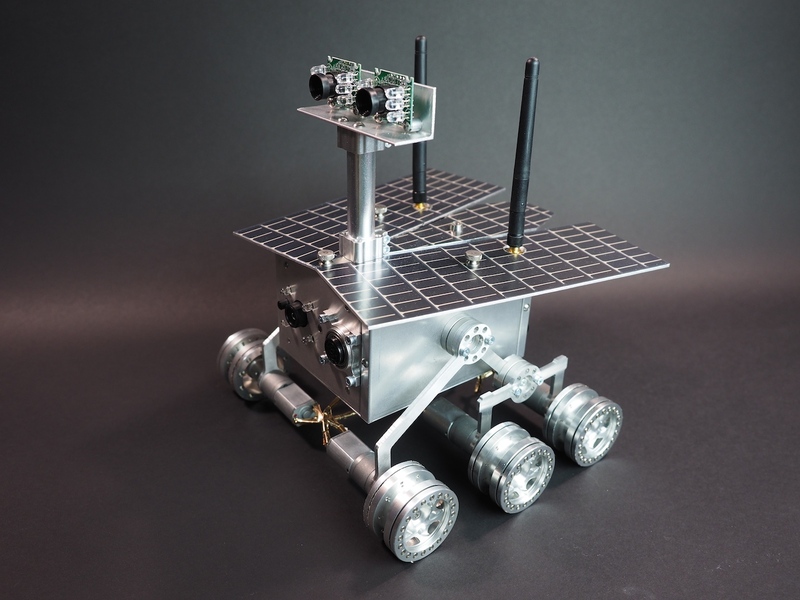 They have a simplified, CNC-machined rocker-bogie suspension system, thin film solar panels, LED indicator lights, six small but powerful gear motors, an Arduino Nano microcontroller, front and rear sonars for object avoidance, a voltage sensor for battery charge monitoring, an audible battery alarm, an on-board battery charge jack, an Xbee radio, and a high-resolution infrared camera. 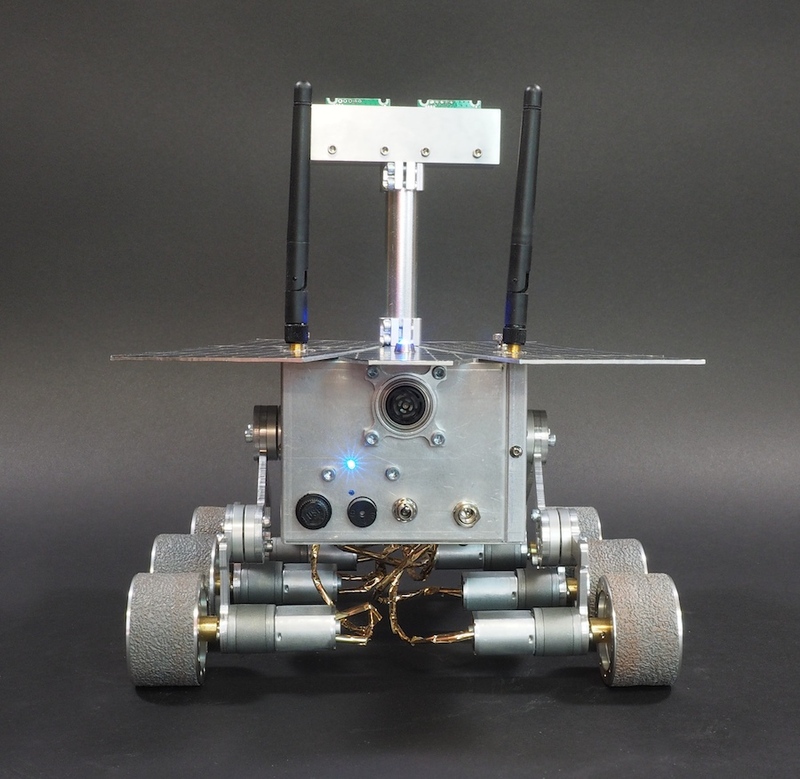 They operate via real-time Remote Control and/or autonomously in conjunction with our “Mars Rover Controller” software. 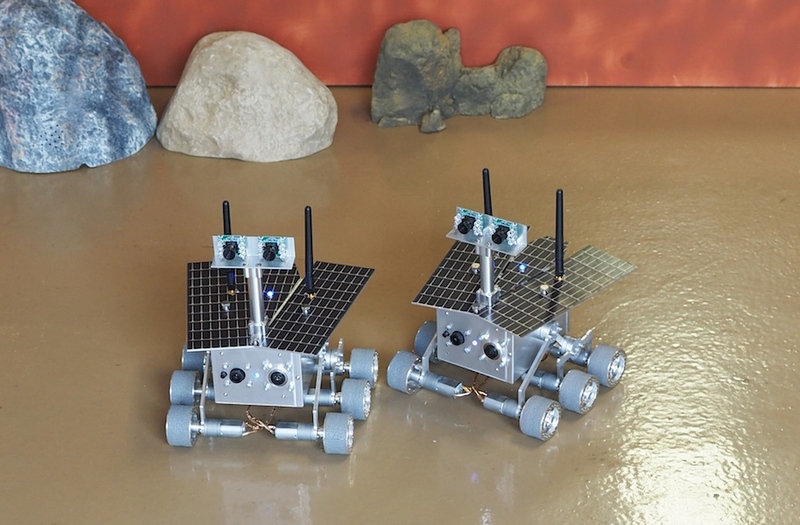 These two robots will be used as functional hands-on exhibits at two different locations. The exhibits are scheduled to open in November, 2014. So, the next time you’re in Malaysia, go check it out. With the top removed, you can see the inside of the robot. We crammed the camera and a sonar sensor at the front. The wifi module (not visible) is attached to the side. The Arduino microcontroller, rear sonar, voltage sensor, motor controller, fuse, battery alarm, xbee radio, two antennas, and power switch are all crammed in the back section. This leaves the center area for a huge 10,400 mAh 7.4V Lithium-Ion battery (black square in center), which will allow the robot to last a long time on one charge. This is the back of the robot, where you can see the sonar, battery alarm LED, battery alarm speaker, charge jack, main power switch, and fuse. We would like to thank our contacts in Malaysia for their excellent work on this project so far. They have been very good to work with. We look forward to helping them (from a distance) to get their robots setup and working at their location. We would also like to thank our part suppliers from servocity.com (hardware components), sparkfun.com (electronics), pololu.com (motors), dimensionengineering.com (motor controller), maxbotix.com (sonars), robotshop.com (electronics), all-battery.com, and mcmaster.com (metal and hardware), to name a few. Do you have, or plan to, put out any tutorial or training material for the projects you create? It would be amazing to be able to work through a similar project to see how it is all put together. I am personally having difficulty culling together what is needed to start my own project. Camille: Thank you. We really appreciate it. We’ve thought about providing much more detail and how-to information in our posts, but we weren’t sure if people would be interested in that. The main problem we have is that we are so busy having fun building stuff that we don’t always slow down long enough to write detailed posts of everything we do. Very cool builds! I know some of the engineers that have helped build and control Spirit, Opportunity, Curiosity and the Phoenix Lander. They work for Planetary Resources (PRI) now. 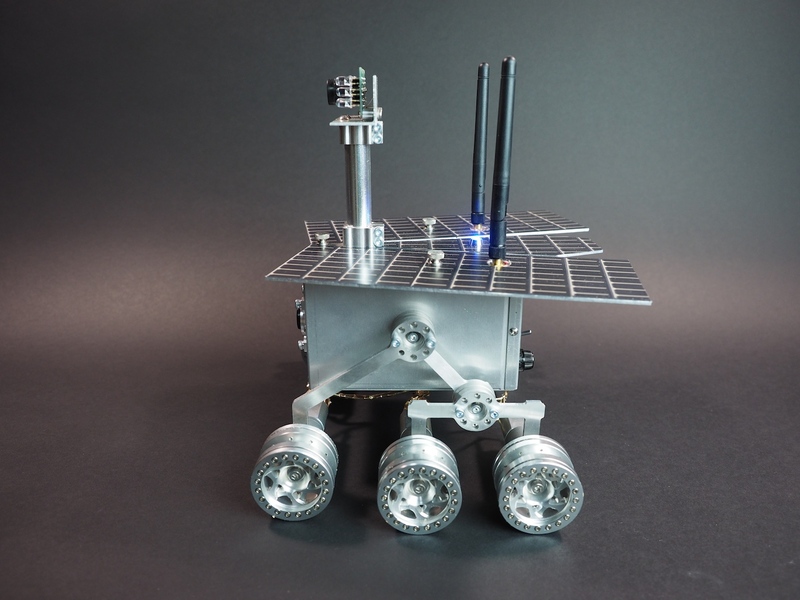 I think they would love to talk with you guys if you’re interested and if you’re in the Seattle area I’m sure they’ll give ya a tour of the facility where they’re building the Arkyd series of Space Telescopes for Asteroid Mining. Just shoot me an email and I’ll make the introductions. On a side note: you May want to consider switching your blog over to something HTML 5 compliant to make it more mobile friendly. Thanks again for sharing your great builds! What motors are you using for the wheel direct drive and what rpm are the motors? This is a great robot and i was wandering if there is an estimated cost on the total amount of parts used for building it? 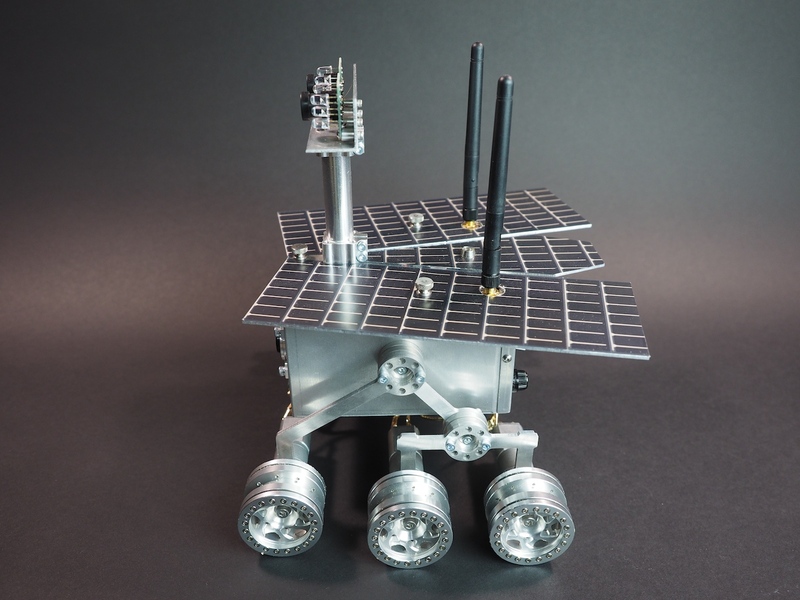 Can I buy a rover like the one you built for the Hall Of Science in New York? Ryan: Yes, we build Mars Rovers under contract, so we could build one of these for you. Hi please let me know how much will a mini rover cost me if I want to purchase one from you. They are just amazing..